I am soooo behind on life. And instead of getting caught up, I am blogging. I am behind on cleaning. I am behind on laundry. I am behind on scrapbooking. I am behind on math homework. I am behind on Real Estate stuff. I am behind on Filing (a part time job a have). Can you be behind on being a wife and a mother? I think I am behind on those as well. 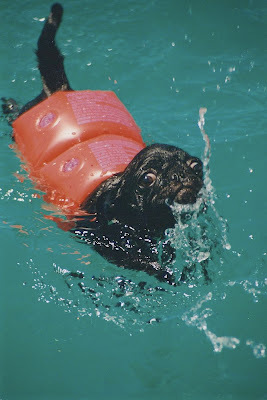 Years ago in a former life, I had this little black pug. 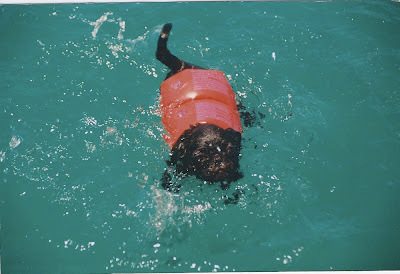 We took her to Bear Lake and uncertain if she could swim, we put one of my nephews arm floaties around her waist. How tiny she must have been. 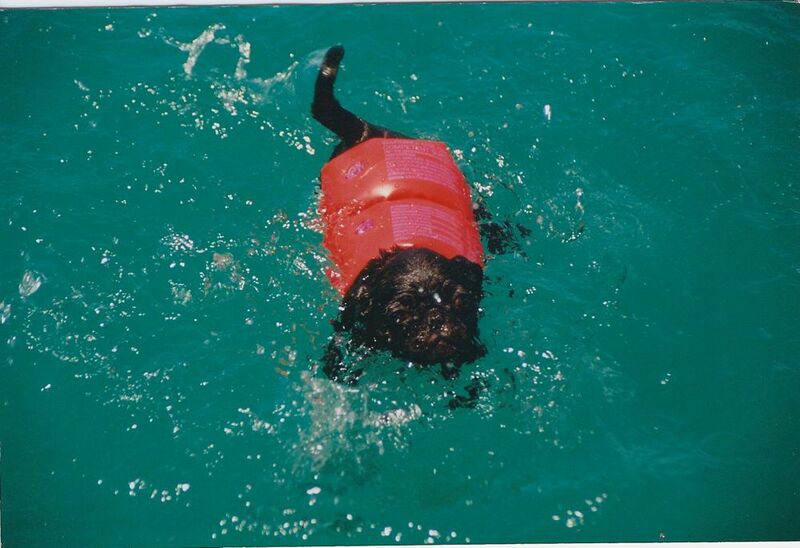 But what a great life preserver. After my minor meltdown yesterday, Josh felt it was in everybody's best interest for me to go out. He graciously offered to watch my sisters kids so we could go out. What to do on a Friday night? I am in no condition for the usual, laser tag, mini golf or para-sailing, so we decided on dinner and a movie. Well all the movies were pretty much sold out and I was not going to go to just dinner on my free night. We went to see "New Moon". I am finding myself eating my words quite a bit lately. I said I would probably see it when the hype had died down or when it was on video, but I certainly was NOT going to see it on opening night. haha. It wasn't bad. I somehow found my humor again and had the guy behind us busting up laughing most the night with my witty remarks. I did however have to reign myself in for fear that the die hard "Twilight" fans may beat me up. I am having a hard time deciding if I am Team Jacob or Team Edward. Edward is a fantasy, he doesn't exist in real life. He says everything you want to hear. He's romantic. He worships her. But thats not real. Jacob is real. He is stable and warm. Most of the time I think I am Team Jacob because I chose the stable real warm person. But then Edward says something that any woman would kill to hear and I teeter. So I decided I would pick from who I most likely wanted to sleep with in the movie. At first, Jacob looked like a girl and didn't do it for me, but then he cut his hair and buffed up and it was him. Total hottie! I made my decision. Then on the way home I got to thinking, he turns in to a wolf. That could be unpleasant. At least with Edward you know what you will be waking up to the next morning. His body was definitely not as ripped as Jacob, but Jacob will age and eventually get fat. Edward will always be the same. So still undecided. Before, the movie, we tried to do the other popular thing and go eat at In-n-Out Burger. That place was crazy. Not a chance. Well there was a chance, after the movie at 1am we only had to wait 20 minutes in the drive thru for that deliciousness! I don't know why it bugs me so bad to do what is trendy. There is nothing wrong with it, I just hate being like everybody else. To this day I still think about changing Aiden's name. I thought it was original, but turns out it is a very popular name. I haven't been blogging much lately. It could be because I have so much on my plate and I am completely overwhelmed! It could be that I feel I have lost my sense of humor. I used to consider myself witty and pretty humorous. I no longer do. Josh will say to me, "You should blog about that." To which I maturely respond, "Why don't you?" He says,"Because I'm not funny like you." Well I don't think I'm funny or clever anymore. Or maybe I'm just so blankety blank tired ALL the time. Physically I think I am doing better, but mentally and emotionally I am a complete basket case. I cry every day! I feel like a failure as a wife and especially as a mother. My son has gone on this downward spiral the last few weeks and I am at a loss. He yells at us all the time. He hits us and kicks us. He hits and pokes and yells at other kids. We feel like we have tried all we can think of and we need help. Josh wouldn't admit it, but I think he is losing his patience with Aiden. I see him raise his voice quicker and getting bothered by his behavior. And Me? Well I lost my temper last week. For 2 weeks I spoke calmly and lovingly and softly. If he hit I remained calm and gently reminded him it is not nice to hit. Put him in time out. Now I am sooooo worn out, all I want to do is beat the crap out of that kid! I wish there was a boot camp for 2 years olds. I went to a girls lunch at a friends today. He hit and poked a little baby. 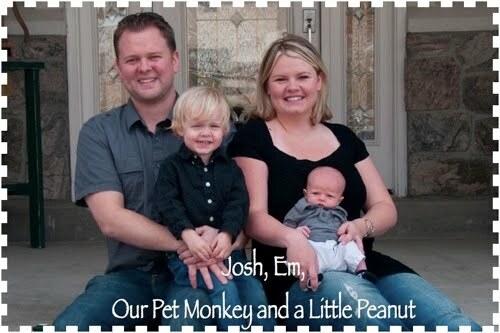 That little baby did nothing to him, nothing at all. I just picked Aiden up and left and cried all the way home. He would say, "it's ok mommy. Don't cry mommy. Be Happy mommy." He has no idea what he is doing to us. I can't leave the house with him. I don't want to be around him, which makes me feel horrible for thinking those thoughts. I am too embarrassed of his behavior to ask people to take him so I can have a break. I am over 6 months pregnant and I just want my old life back. The one where I could move and my body could keep up with me. 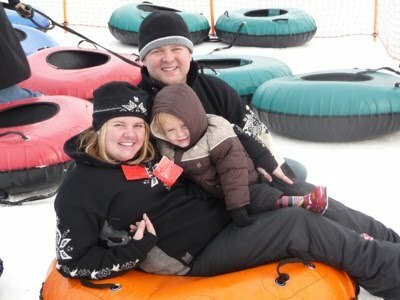 The one where my son loved me and I loved him and we enjoyed spending time together. Where I didn't count the minutes until nap time and then count them again until Josh gets home. How's that for depressing? Any body have any antidepressants for me or something for Aiden? I LOVE Burger King breakfast, especially when I am pregnant. When we lived in Maryland, it was sometimes the only thing that got me out of bed some days. On more than one occassion, I didn't make it in time and barely missed it and I cried. Yes I cried. I have found one near the college and will sometimes go get it instead of studying. Well it's been almost a month since my last visit and I went yesterday to get a yummy croissantwich. But the Burger King is under remodeling construction. I didn't cry this time, but I am sad. There isn't a Burger close enough to my home and now the one by the college is closed. Why me? It is crazy how much I LOVE Halloween!!! It's only a few hours, and I can't explain why I love it, I just do. 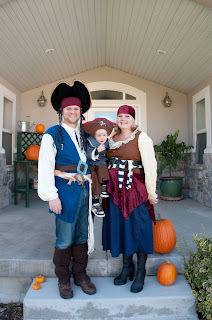 We were pirates this year. 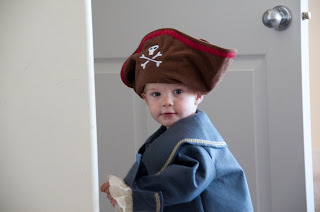 All week we have been talking like pirates to teach Aiden. 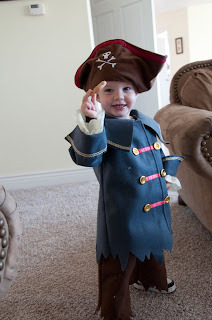 He loved it, although we only know about 3 or 4 pirate phrases. 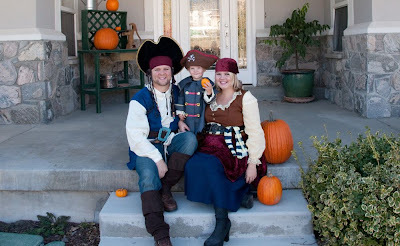 The suspense is over, now you can all see how cute we were on Halloween. Then it was off to Grandma Jackie's for some Trick r Treating. 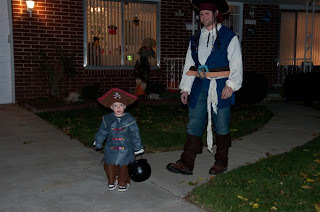 Aiden was so good, he said "trick or treat" at every door and "thank you" after they gave him candy. I was worried his politeness had left when the rotten two year old moved in. Last year, every time somebody gave him candy, it went straight into his mouth or back up hand, then at the next house he didn't know what to do to get the new piece. 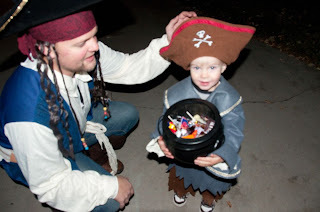 This year no candy went in the mouth, but even when his bucket was very heavy he would NOT let Daddy hold it for him. 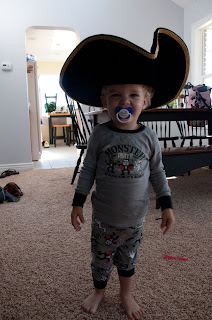 At home in Halloween jammies and Daddy's Pirate hat.